Total Gym 2000 home gym is ideal for beginners in fitness, who are looking for an exercise program to help start a healthy lifestyle. You get all the essential ingredients in order to reach your fitness goals. Starting a new fitness routine doesn’t have to be intimidating or overwhelming with this home exercise system. + Free Shipping & 30-day In-Home Trial! 1-800-618-7401 and speak to a live representative! You can start a healthy lifestyle today by your choice in purchasing the 2000 model. Anyone can use it, as it is suited for all types of bodies. The design of the machine is completely user-friendly – no sore joints or strained muscles anymore. The design of the machine allows you to build strength, as well as tone and firm your problem areas, while enhancing your best features. In only a few minutes a day, you will see improvement in your overall shape, strength, and level of energy. You will feel confident about how you look, and know that you are doing something great for your body and your self. What could be better? Exercise options – over 40 Total Gym exercises for you to choose from. The movements in Total Gym 2000 are smooth and continuous, allowing you to shift from one exercise to the next. You don’t have to stop in between workouts to switch from one machine to another. Exercises for the 2000 model can be found in the Start Up video that is included with the machine, as well as over 40 suggested work-outs to get each part of your body exactly where you want it to be. With the 2000 model, you’ll receive the easy to follow Start It Up! 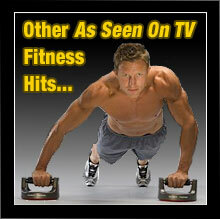 DVD – Your very first workout with your new fitness system. The Total Gym 2000 model comes with a guarantee, so if something breaks for any reason, you will receive a replacement, at no extra cost to you. Compare the Total Gym 2000 to other Total Gym models and see how it stacks up. Order today and begin your healthy routine tomorrow. 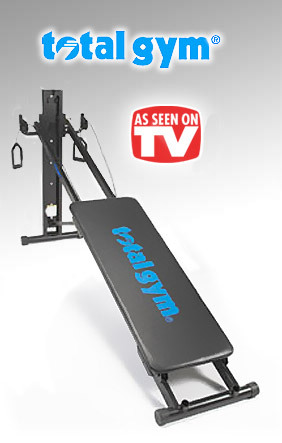 Order the 2000 right now for great low prices and the experience you have always wanted in personal fitness equipment. I've had my Total Gym 2000 for several weeks now and there's no way I'll be returning it. After I gave birth to my son I started looking for a reasonably priced exercise system that could help me get back into pre-pregnancy condition in the comfort of my home. Gyms had become too much trouble and the closest one to me was too long a drive so that really wasn't an option for me. I saw the Total Gym infomercial one night and it looked like a good solution. I went online to do some further research and decided to order the 2000. Once it arrived it didn't take long at all to get set up. My first workout was a real eye-opener, I hadn't had a workout that thorough in well... ever. Subsequent workouts just got better. I feel that I'm now well on the way to being in even better shape than before I got pregnant so I'm very enthused about that! BTW I didn't notice any excess noise that some other reviews mentioned so they must have fixed that issue. Recommended for moms everywhere! I was looking for a fitness system that I could get a full body workout on without breaking the bank and the TG 2000 totally met that criteria and exceeded my expectations. This is one well thought out machine. Of course you get out of exercise what you put into it but the science behind this gym makes it a lot easier. I love how many different exercises I can do on this thing! My girlfriend turned me onto the Total Gym and I'm sure glad that she did. I've tried a lot of fitness products over the years and this one stands head and shoulders above them all. Simple to use and super effective. I'm actually enjoying working out for the first time in years! A neverending array of exercises you can do, easy to use, rugged construction and space-saving design. What more could you ask for in a home gym? I used to have a bulky weight set that pretty much took over my spare bedroom but I sold it a month after I bought my Total Gym. Every time I use it I do a different workout so it's always fun and challenging. Exercise is hard enough, why not make it more interesting and fun? I would recommend the Total Gym 2000 to anyone who's tired of the same old same from the fitness industry. I swear by my Total Gym. Like my review title says I used to be Big Jim but thanks to the Total Gym 2000 I'm now known as Slim Jim. It wasn't an easy journey losing 50+ pounds over the past year but thanks to some diet changes and my daily workouts I'm getting into the shape that I've always wanted to be in. The ladies like it too which is just fine with me! I've had my Total Gym 2000 for about 3 months and I wouldn't give it up for anything. It's honestly the best purchase I've made in quite a while. I started looking for a workout system when I woke up and realized I had packed on more pounds than I care to admit. 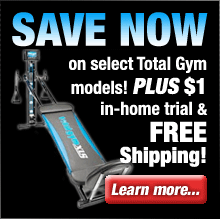 I saw where several fitness sites recommended the Total Gym so I searched around and found it on sale here. I hadn't worked out in a while so I stated out with light workouts for the first month. As I started noticing more energy from working out and eating healthier I began to ramp up the volume so to speak. I'm happy to report that 3 months later I'm definitely seeing and feeling the difference. I have no doubt that I'll be achieving my fitness goals thanks to the Total Gym 2000. My husband and I were looking for a good basic fitness solution we could share that would enable both of us to get a decent "full-body" workout. Both of us feel that the Total Gym 2000 doesn't disappoint in that respect. Neither of us needed anything heavy duty or a bunch of "bells and whistles" so while the XLS offered a lot more options the 2000 was pretty much all we needed. We've found it to be a good overall fitness system that lives up to the hype. Wish it came with more workout DVDs but that's a minor quibble. Very easy to use workout machine. I have built muscle and overall strength. The machine is easy to use and setup. The pulleys are a bit noisy but not too distracting. I use it while my son is down for his nap and I am able to get a good workout in with little complications by myself. It was delivered in good condition and quickly. The box it was packaged in was busted a bit but the machine was intact and complete. I've been using my Total Gym for approx. 10 years, now. I absolutely love it, still to this day. No other fitness machine or workout class, I've tried (and there were many over the years) can truely compare to the Total Gym. Along with the advertised Total Gym exercies, I've developed a number of safe exercises I use to strengthen my toes, fingers, neck and other body parts. The Total Gym is a true healing machine. I am a distance runner and use my Total Gym for core strengthening, quad work and overall fitness. I find that it is a great adjunct to my running. I was experiencing some knee pain and had strengthen my quads. The exercises were effective and my knee pain disappeared. I'm not a gym person and find the Total gym very effective and convenient.